We have planned a day out in Scarborough. But as we have no set agenda to our activities we change our mind on route. We are driving along the road and see the attractive open moorland and decide to go for a walk instead. Not a long walk, but enough to see if Lynnie’s back is okay over rough ground. We park up at Sneaton Corner and take the footpath that leads us across the moor past Thorn Key Howes to Thorn Key Wath. This path is not the easiest to follow but eventually we find the footbridge that takes us over the beck. The map says the track we are following is the Robin Hood’s Bay Road, as we continue it is a clear path for a while. We think we should carry on in a straight line but the clear path swings to the right so we follow it. Eventually we reach a point where footpaths cross. I identify that we are at John Cross, not where we had intended to be but it has shortened the route. We want to take a path to our right but it is not clear where the path is. As we consult the map a couple join us from the direction of Newton House Plantation. They know the area and say the paths are not clear. 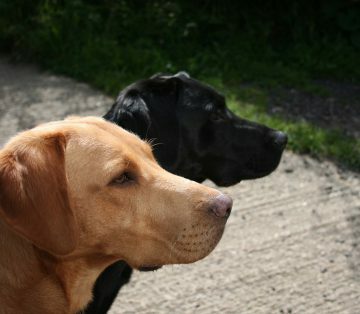 So after a pleasant chat, during which Dexter and Crosby manage to purloin a custard cream from their new friends, we bid each other farewell and head off trying to find a path that runs parallel to the stone wall. Eventually we locate the path and follow this to a gate by the B1416, instead of going through the gate we turn right and follow a path back across the moor. We are treated to two Curlews trying to distract us from their young. Our route takes us back to Thorn Key Wath and from there we return to Sneaton Corner, the path is much easier to follow from this direction. It has been a pleasant wander on open moorland, just over four miles at a steady pace. Lynnie has coped, but would not want to go much further. Back in the car we decide to abandon our plans to go to Scarborough and visit Robin Hood’s Bay instead. Parking at the top of the hill we walk down the steep narrow road to the bottom of the village. This place is seriously geared up for tourism, holiday cottages everywhere and the pubs and cafes doing a roaring trade. 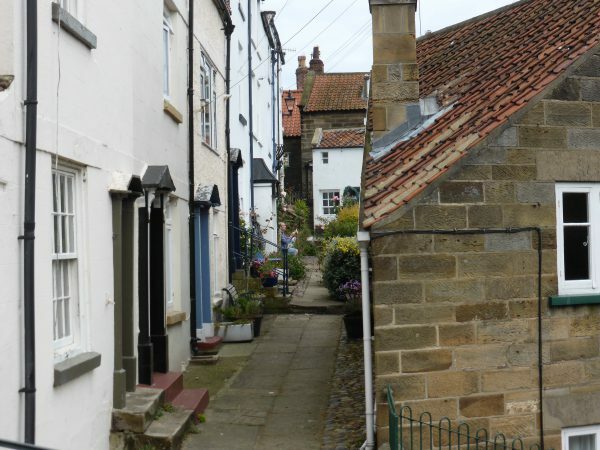 In the past Robin Hood’s Bay was a haven for smugglers with the narrow passages between cottages ideal for concealing contraband. It is rumoured that there was a network of underground passages in the village to make it easier to move the illegal goods. 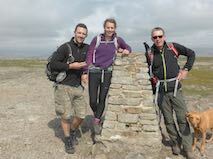 The village is the conclusion of Alfred Wainwright’s Coast to Coast walk. The point where you reach the sea by the lifeboat station is an attractive sight. Even more attractive if you have just walked 192 miles. Many years ago Lynnie and I visited Whitby on holiday and purchased some prints by the famous photographer Frank Sutcliffe, one of the prints that hangs on our wall (well it did when we had a wall to hang it on – it is now in storage) is a picture of Henry Freeman the sole survivor of the 1861 Whitby lifeboat disaster. This was a remarkable story of a storm on 9th February 1861. The Whitby lifeboat was launched four times that day in heavy seas to make separate rescues. On the fourth occasion the lifeboat capsized and all the crew lost apart from Henry Freeman. It was his first day as a lifeboat man and he was the only member of the crew to be wearing a newly developed cork flotation jacket, he went on to serve another forty years as a lifeboat man. This story is surpassed by the tale of 19th January 1881, which also involved Freeman. On that occasion a storm was blowing so fierce that the Lifeboat could not be launched at Whitby to attend a rescue at Robin Hood’s Bay. The crew decided that the only option was to drag the lifeboat inland on a seven mile journey. They were aided by horses, but hampered by seven foot snow drifts. Up to 200 men where involved in digging a route and they made the journey in two hours. Lynnie and I walk at a pace of about 3.5 miles per hour. It is remarkable that they could move a lifeboat at a similar pace. 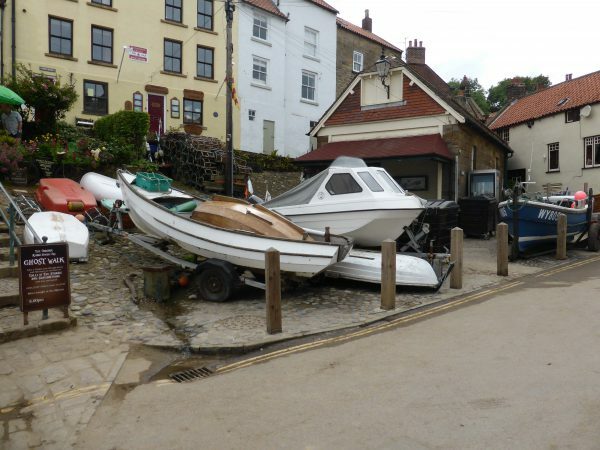 The boat was launched at Robin Hood’s Bay and the rescue made. The men returned on foot and went back for their lifeboat later on a calmer day to sail it back to Whitby. Both sobering tales of the extraordinary lengths that some men go to for the sake of others. I wonder if the chap I hear moaning about the strength of the mobile phone signal in the village ever stops to think about what life was like here many years ago. 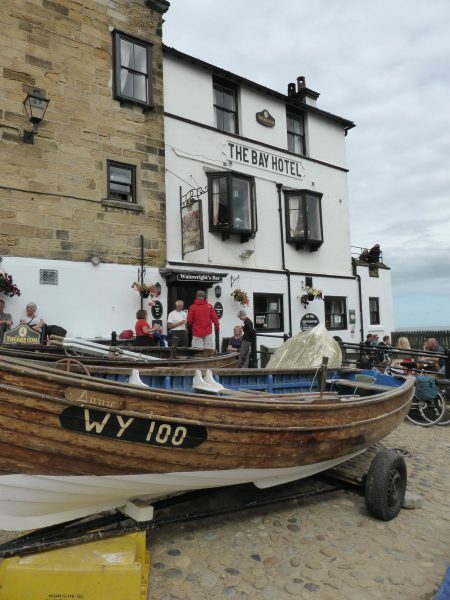 We agree that Robin Hood’s Bay is a pretty village, but far too busy for our liking. When we get back home I will look forward to rehanging the picture of Henry Freeman and when I am having a bad day will think about the traumas he faced. 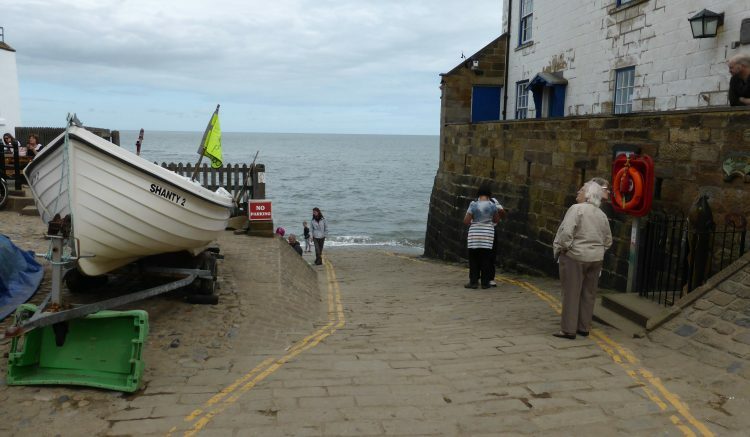 Your photos & description of Robin Hoods Bay remind me of Mevagissy (south of St Austell). A nice place to wander round for an hour in the off-season (especially if you get the chance to buy fresh fish down on the quay) but I wouldn’t want to stay there.